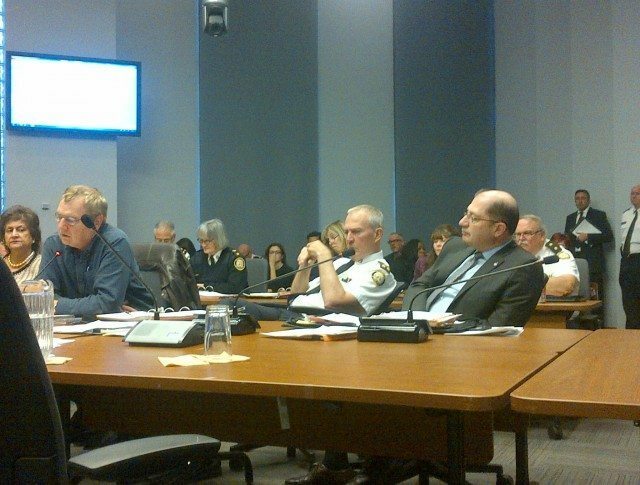 Police Chief Bill Blair (centre) at Thursday’s Police Services Board meeting. Photo by Desmond Cole. Police Chief Bill Blair has rejected a report that suggests officers in northwest Toronto are ignoring a new policy on carding, the controversial practice of stopping civilians for non-investigative reasons and documenting their personal information. At yesterday’s Toronto Police Services Board meeting, Blair dismissed the report’s findings and scolded board chair Alok Mukherjee for speaking publicly about it before its release. The LogicalOutcomes report surveyed more than 400 residents in the northwest corner of the city patrolled by 31 Division. It suggests police have failed to follow the new carding policy approved by the board in April. Ninety-three per cent of survey participants said they were unaware of the new policy; of survey participants who had been carded, nearly half said police had spoken to them disrespectfully; a third of respondents said police told them they fit the description of a criminal suspect; one quarter of those carded said they feel as if the police are constantly watching them; and one quarter said they avoid going out at certain times because of police. The TPSB commissioned the report after approving the new policy. Board members wanted to know if residents were seeing changes in their interactions with police. Blair defended the conduct of 31 Division officers, and argued that carding in the area surveyed has declined substantially. “Over a three month period this past summer, the officers in 31 Division submitted a total of 83 community safety notes,” said Blair, noting that more than 120,000 people live in the area. Torontoist asked Blair if police issued receipts for each of those 83 interactions; Blair replied, “I can only confirm to you that we’ve looked at the number of contact cards submitted.” The LogicalOutcomes report notes that in September researchers asked 31 Division to provide data on carding and criminal activity, but that no data was made available in time for the report’s publication. Eighty-five per cent of survey respondents who had been carded since June said they did not receive a receipt from police. According to the Police and Community Engagement Report (PACER), frontline officers have said issuing receipts is too time consuming and “encourages impulsive public complaints” even when officers are acting professionally. The board did not address the findings of the report during the meeting; members said they had received it only on Thursday morning. Instead, the board deferred discussion of the findings to a special meeting on November 26. Read the full Community Assessment of Police Practices Community Satisfaction Survey below.